At a glance table tennis looks like an easy sport to master. Everyone has played before, and a large amount of Americans have a table right in their home. So why hasn’t this sport caught on like other sports. There is a quiet opposition that poses a real threat to that learning curve, and that opposition is SPIN. To play table tennis requires a tremendous amount of ability, but the dynamic of spin still makes it a skill-based sport, and I’ll explain.At the beginner level table tennis is not a basic sport, and it’s because of the dynamic of spin. When you take a look at a sport like Basketball, the rules at which the sport is played at a low level are simpler than table tennis. It is very easy to learn how to dribble, pass, shoot, and play defense against one person. And you can quickly get involved with the sport at a low level and get an awesome workout. That is because at the beginner level, the sport is more ability-based. Where Basketball gets complicated is when you face a player that has more natural ability than you like height, speed, reach, or the ability to jump higher. That is when you have hit a plateau. You can still get a great workout running up and down the court, but you will be overwhelmed by a athlete that is taller, faster, with more reach, even if his basic skills are the same. 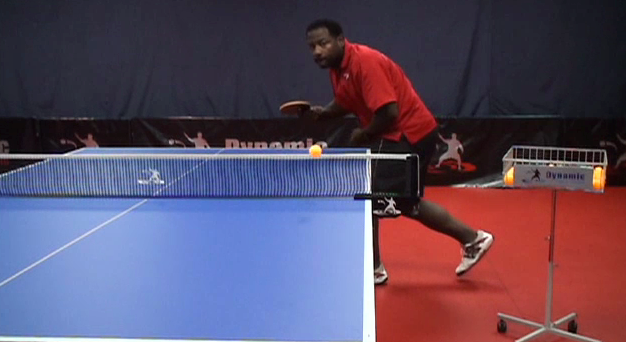 The Dynamic of Spin in table tennis makes it difficult to get a continuous workout because that plays a big factor in almost every point that is played. If you go to your local fitness club you can participate in a multitude of workouts that will have a cardio blast affect on your body. You can go into a basic kick boxing class and burn 1000 calories in 1 hour, and get a very intense workout. The same goes if you take a Spin Class, High Impact Aerobics, or Dance Class. What every person responds to is the ability to gauge how many calories they’re burning in that time. These sports are more ability based, and the feedback is immediate. There are 2 ways that table tennis becomes very skilled based at a basic level, and the first one is rpm’s, which stands for revolutions per minute. Playing against spin shots are normal, and what quickly amplifies things is when there is a tremendous amount of spin put on the ball. If a player does not have the ability to identity how much spin is on the ball and make the necessary adjustment to return it, you will most likely see unforced error after unforced error. What makes this a challenge is the ability to put spin on the ball varies from player to player, so you can’t only have a general knowledge of how to return spin, you have to have a specific one also. The second way the sport is skill based at the basic level is the ability to read different types of spins put on the ball, especially on the serve return. This is the main aspect of table tennis that the general population is unaware of, and the main reason a player will put the racket down on the table in confusion. There are 3 general types of spin put on the ball with the serve, and they are topspin, underspin, and lateral spin. The first 2 serves are simpler, but lateral spin is what makes the sport complicated and intricate. Lateral spin is when the ball is contacted on the equator line of the ball, which makes the ball travel at an angle. Where this can become a technical quagmire is when you start to see variations of all these serves put together. A forehand lateral spin/topspin serve has a different contact point to return it than a forehand lateral spin/underspin serve. And what compounds that complication is a forehand lateral spin/underspin serve can travel in the opposite direction of a backhand lateral spin/topspin serve. These serves are done for 2 reasons. The first reason is to overwhelm you with how much spin is on the ball, in hopes of making an outright error. The second and more realistic reason is to set up an attack shot that is sure to have spin on it. To combat this epidemic of not being able to return the ball, there has been equipment created to solely combat spin. The use of short, medium, long pips, and anti rubber has added a variation that by-passes the dynamic of spin. Pip rubbers has the pimples out, and each rubber has different characteristics based on the waffle cut on the pip, length and width of the pip, or sponge thickness. The short pips is the rubber that neutralizes the spin the least, but it has the most potential to create crisp attack shots. At the basic level the pimps don’t create much spin and play more like a knuckle ball. The medium pips are more like a middle of the road type of rubber, because it has a higher ability to neutralize spin but a lower ability to create crisp attack shot. The long pips are the king of the serve return amongst the pip rubbers, and it has the lowest potential to create a basic attack shot because the pip is so long. It is mostly used as a defensive type of rubber that has the ability to turn a topspin attack into a heavy underspin return. The Anti rubber is solely a rubber than can neutralize the spin that is on the ball, making it great on the serve return. It has a very low potential to create attack shots, but is very good at taking an attack shot and putting a very strange spin on it, making it more difficult to follow up with another attack shot. Using these types of rubbers will allow a player to avoid that learning curve of understanding how to read spin. But at some point and in most cases the equipment becomes inferior. The truest dynamic is not about the ability to return the spin, it’s about the ability to identify what type of spin is on the ball. The fact that 10 different player may have designed 10 different approaches to how they execute the same serve is what makes table tennis a highly skill based sport at the beginner level. Having more table tennis coaches in America that can teach the dynamic of spin and how to return it should be a priority. Everyone has seen a new player come into the local club with the ambition of being a good player. Only to have those hopes dashed when they are simply served off the table by a 1200 rated player. That is the type of player that has a bad experience and retreats back to their garage, basement, or patio to play amongst the players of the world that don’t use spin as a tool for victory. In America there is a motto of “May the best man win”, and in table tennis that motto is “May the most skilled man win”. Table Tennis is violent like boxing, cerebral like chess, combative like fencing, and graceful like ballroom dancing. But it still requires a tremendous amount of focus on one detail of the game, and that is the dynamic of spin. Every beginner should read this article. I played table tennis as a youngster about 40 years ago in Trinidad ; and now I am learning the game the proper way. Your article opened my eyes to the secret of Table Tennis. I ordered your Textbook Table Tennis DVD and I am looking forward to learning the game of Table Tennis from a Master.